If you are applying for a lot of substance abuse jobs and not receiving any response to your applications or resume, you are not alone. In past years, most job applications and resume submittals were, at the very least, acknowledged with a form letter. This is no longer the case. On the one hand, this can be considered rude and unprofessional on the part of the various companies that are failing to even acknowledge your existence. On the other hand, you could cut them a little bit of slack as they are incredibly overwhelmed. Consider that the HR, or Personnel, departments at many companies have suffered cut backs right along with everyone else in this economy. Also, many in HR departments are sympathetic to the plight of the job seeker and just don’t have the manpower to respond to all of the inquiries for one open position. One thing you can do is try to get your resume in front of someone other than the hiring manager. I know it sounds strange but hear me out. If you can get your resume, on paper or electronically, in front of an executive who is a few levels above the hiring manager and they take notice of it, they are likely to give it more than the cursory 10 second read. 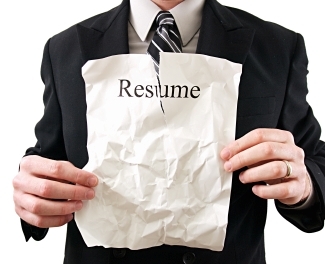 Also a resume that is passed “down” the food chain from an upper-level manager, will get more attention. It’s always worth a shot. If you are not receiving responses to your resumes, consider also that you are not tailoring your resume enough to each particular job and not “following directions”. If a job listing says that the applicant “must have” such and such qualifications and you have nothing of the sort on your resume, don’t expect a call and you should be ashamed for contributing to the death of another tree. It is also possible that the jobs are being filled internally. This is more common than you think. Jobs are listed externally as a matter of “policy” yet are filled internally and the company never bothers to read a single resume or interview anyone. Other times, jobs are eliminated as a budget or attrition consideration and HR didn’t get the memo. You may have been late to this particular party. If the company listed the job opening 6 weeks ago and you just sent in your application 2 weeks ago, consider that there are probably hundreds of resumes ahead of yours. In a job search, most of the time, the early bird gets the worm and that is why “job alerts” are a valuable tool to use on job search websites (we have them!). You can register for the site, put in your search parameters and get notified via email when there are new job listings that match. Paying attention to the basics is, well, Basic and we continue to stress this over and over again. If your resume has formatting errors and even one misspelled word, there are many hiring managers that won’t give you a second glance. There’s no excuse for this. If this isn’t your strong suit, get help! You may still be in the running. Just because you haven’t heard from anyone in 2 weeks, or even 4 weeks, doesn’t mean that all hope is lost. Some HR departments are so bogged down that it takes them literally months to go through applicants and fill an open position. Your interview call for one of those substance abuse jobs could be just around the corner!